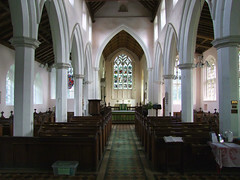 Cockfield is a large, sprawling parish with a small population, living around scattered greens and along the ancient road at the heart of the old village. 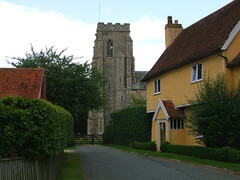 The church sits up a lane, past the war memorial and the village school. It feels intensely rural. 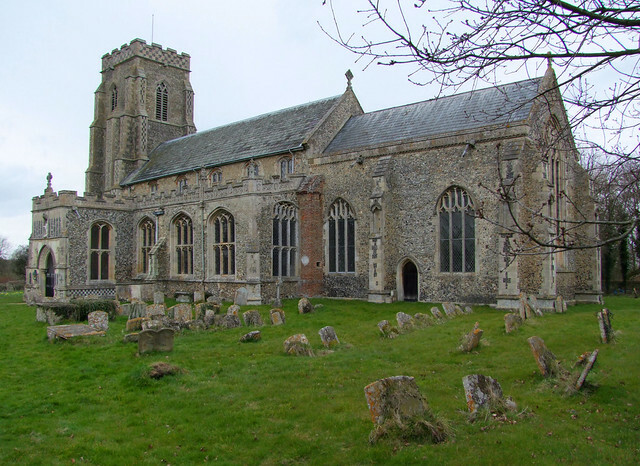 Externally, St Peter is one of the great Suffolk churches. It is big. It sits in what was one of the county's wealthiest medieval parishes; a 19th century Rector here would take home £1050 a year, roughly £200,000 in today's money. 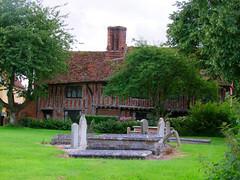 He would also get to live in the stunning former gild house, on the south-eastern side of the graveyard. Not surprisingly, few of them moved on, or retired. 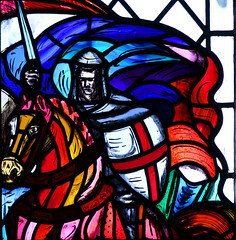 The church was a major construction of the 14th century, a lengthy, single campaign and then embellished with all that the 15th century had to offer. Given that the Springs and the de Veres were residents, this may come as no surprise; the parish must have been awash with cash. The building could be used in a textbook to illustrate the development from Decorated to Perpendicular. Perhaps the most striking features at first sight are the elaborate image niches in the buttresses to the east. 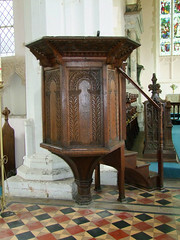 The chancel is probably the oldest part of the church, and these echo niches seen in the east end at Cotton, which is of a similar age. The quality here, however, is superb. 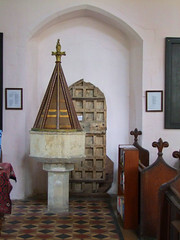 The tower followed soon after the chancel. 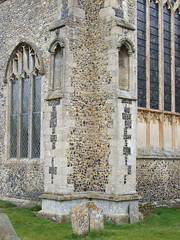 There are very curious flint-infillings of door-sized panels right at the top of the tower on the north and south sides. Mortlock claims that they were windows put in by an 18th century Rector to enable him to pursue his enthusiasm for astronomy. Can this be right? I'd like to think so. It would also give us an idea what he was spending all his money on. 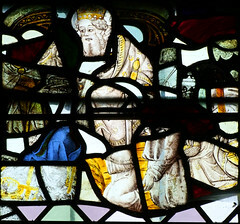 Alternatively, they might once have been massive image niches, although I've not seen their like elsewhere. The south side was probably the last bit finished, and the grandness of the aisle battlements reflect this. 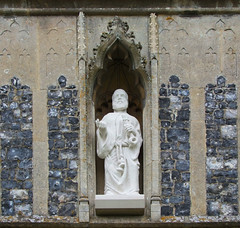 The porch has three massive niches that cannot have been used for very long. 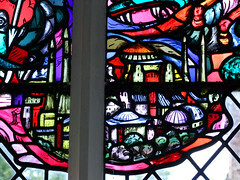 The whole piece seems rather too magnificent for such a rural outpost; but remember, in the late 15th century, Cockfield was at the heart of industrial England, midway between the three great merchant towns of Lavenham, Sudbury and Bury St Edmunds. This is reflected by the interior - you feel as if you are stepping into a large, urban church. In part, this is a result of the significant 19th century restoration, which replaced all the furnishings and most of the windows. It was not done unkindly; not much had survived the medieval period, and what did was taken care of. 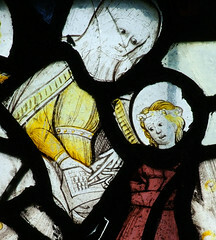 At the east end of the south aisle are some fine panels of medieval glass, including a tender scene of St Anne teaching the Blessed Virgin to read. 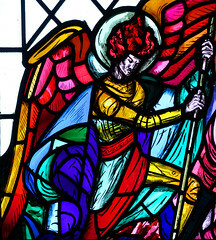 Across the church in the east window of the north aisle is a dramatic modern depiction of St Michael and St George above the City of God. I think the artist was Rosemary Everett. 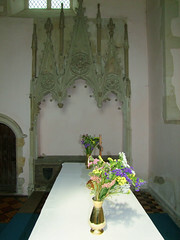 Rather too taken care of was one of Suffolk's largest Easter sepulchres, up in the chancel. Contemporary with the chancel, the Victorians recut it it with more enthusiasm than accuracy, I fear - although, as Mortlock says, the effect is impressive. The blank shields in the base are original. 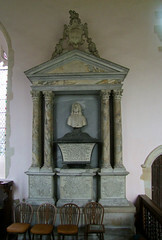 Just to the west is the grand memorial to James Harvey, who died in his early twenties in 1723. 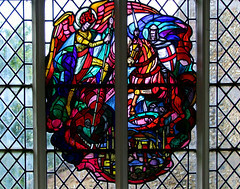 This is the full Georgian works; indeed, it probably dates from a half century after Harvey's death. 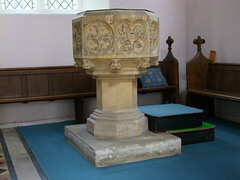 The church has two fonts. 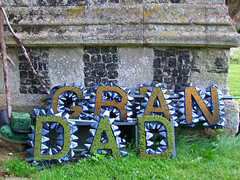 One of them, the Victorian one, is set at the east end of the north aisle. The medieval one is at the other end of the aisle, with a rather unusual display behind it - a detached medieval door. An unlikely name associated with Cockfield given its long history is the author Robert Louis Stephenson. 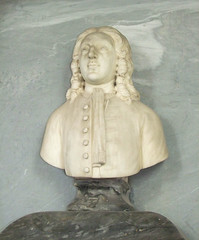 His cousin married Churchill Babington, the redoubtable Rector of Cockfield. 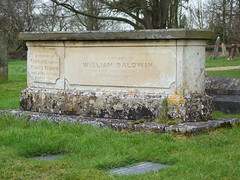 Babington was better known in his day as a naturalist, antiquarian and writer, and was greatly admired by Prime Minister William Gladstone. The young Stephenson came often to visit and stay with his cousin and her remarkable husband, writing enthusiastically of his adventures and explorations in and around the village, and giving a vivid Scotsman's eye view of a genteel and civilised English country parish in the later years of the 19th Century. 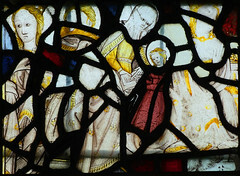 Three hundred years earlier, Cockfield had been a hotbed of puritanism, as befits a place in the heartland of the first English industrial revolution. Mortlock recalls the elegantly named John Knewstub, Rector here in the 1580s, who convened one of the early conferences to discuss a way of getting rid of Bishops and Cathedrals, and replacing them with a presbyterian system of church government. His enthusiasms would lead inexorably to the English Civil War.